My first project since I’ve come back to my farm has been to make a set of 20 cups in collaboration with my sister-in-law, Alanna Rose. 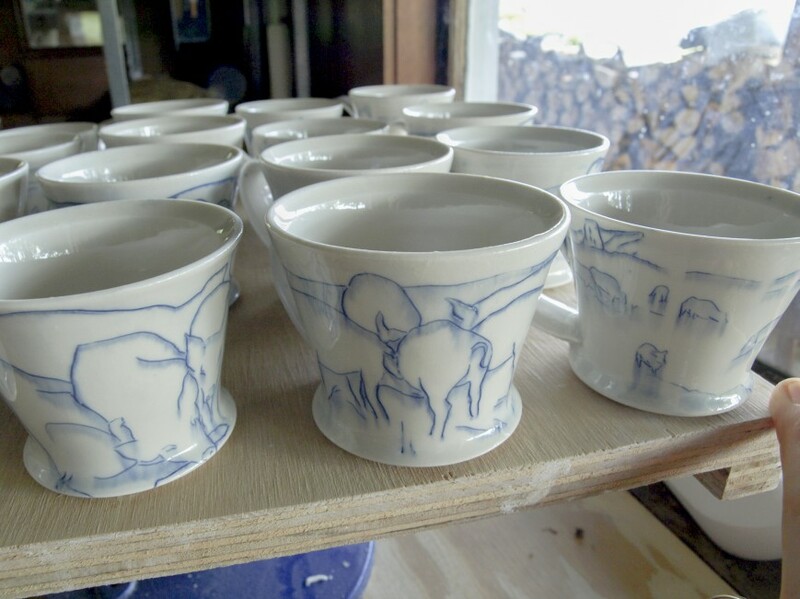 I designed and threw the cup forms and she decorated them with cobalt line drawings of our farm animals: cows, turkeys, pigs, ducks, chickens. I just pulled them out of the kiln today and am thrilled with the results. These cups will be gifts to our Cairncrest Farm customers who pre-order 100 lbs of meat or more from us this week. Two weeks ago, we sent three cows (well, technically, one cow and two steers…) to the slaughterhouse. The dry aging now complete, we will be picking it up on Monday, and taking it to the Bryn Athyn Bounty Market in Bryn Athyn, PA the following weekend (August 16th). Any leftover cups will be sold at the market for $50.